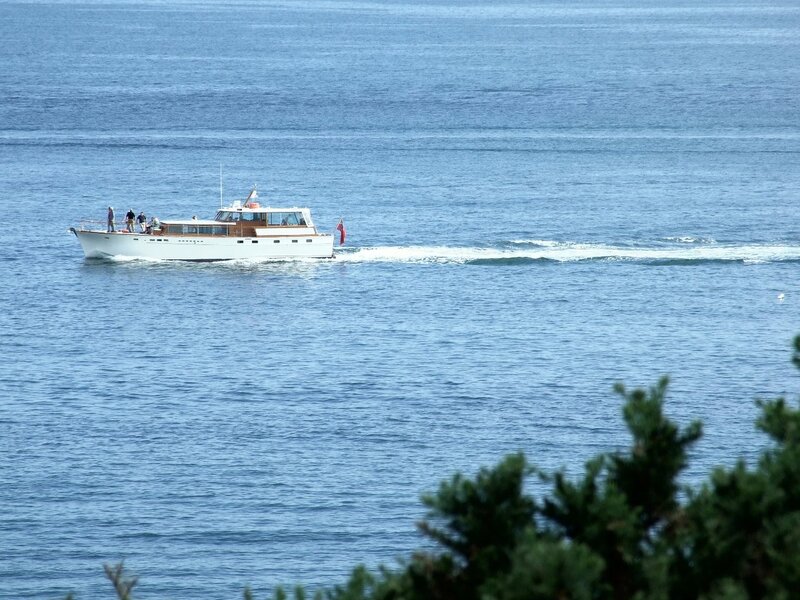 I would be pretty certain the small boat is a carvel built boarding boat, typical of many West Country small craft and looks to my eye to have been built before the advent of strip-planking? I wondered whether it might be Barnabas, but didn't know the link. Barnabas looks very much like the boat in my photo – could it be that the boat I photographed in the harbour at St Ives is the same boat again? It seems unlikely, but it's obviously possible. The red boarding boat's interesting – she did look old, but not knowing the type I couldn't be confident, as she's quite lightly framed. 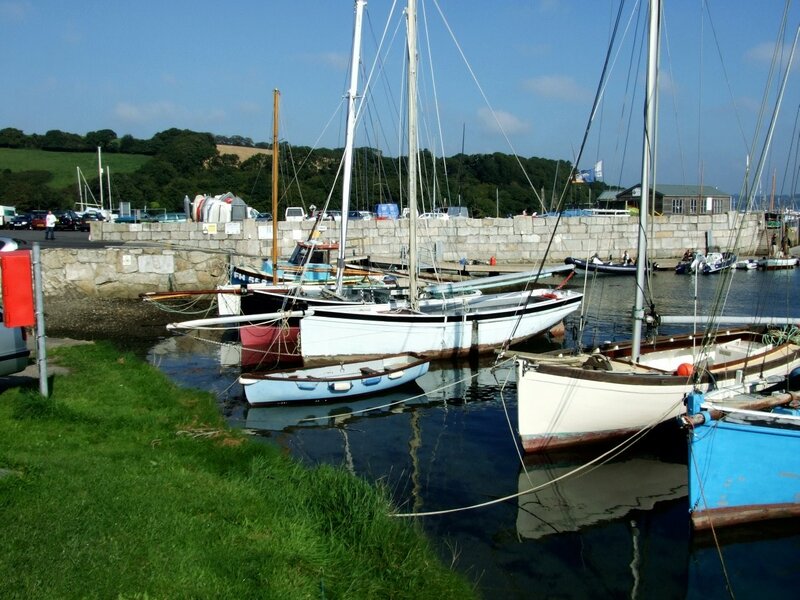 Were these boats predominantly for posh yachts or working craft, I wonder? I guess they must have been more expensive to build than clinker equivalents. I forgot – I did manage to snap Barnabas at Falmouth: http://tinyurl.com/4xxmet . She's not the boat I photographed earlier at St Ives. Carvel built. It's a "punt". 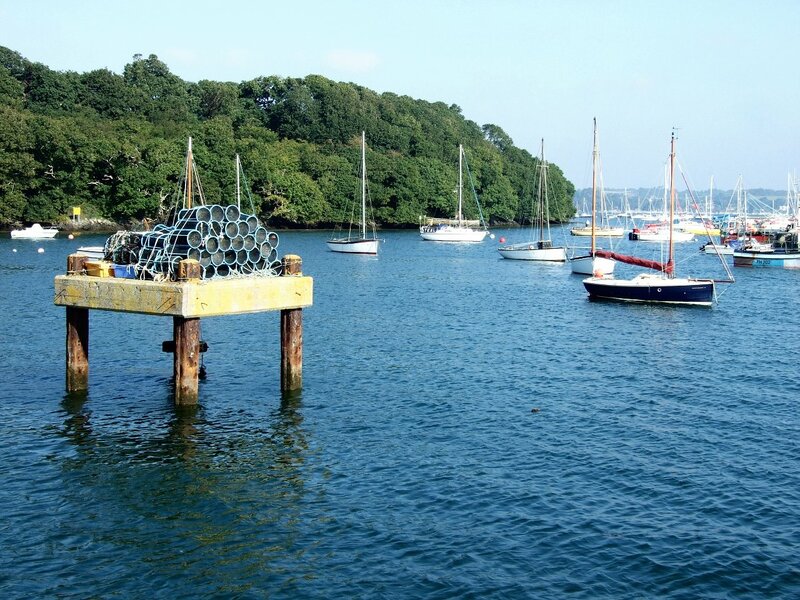 This looks a lightly built one, probably built for racing, but based on the traditional harbour craft of the Fal. The sturdier ones were used for dredging (oysters) using a rather interesting low tech winch. So racing is the answer! Thanks John, it's good to be able to answer the question. I've seen the heavier boats and their winches, and will put up some photos at some point. 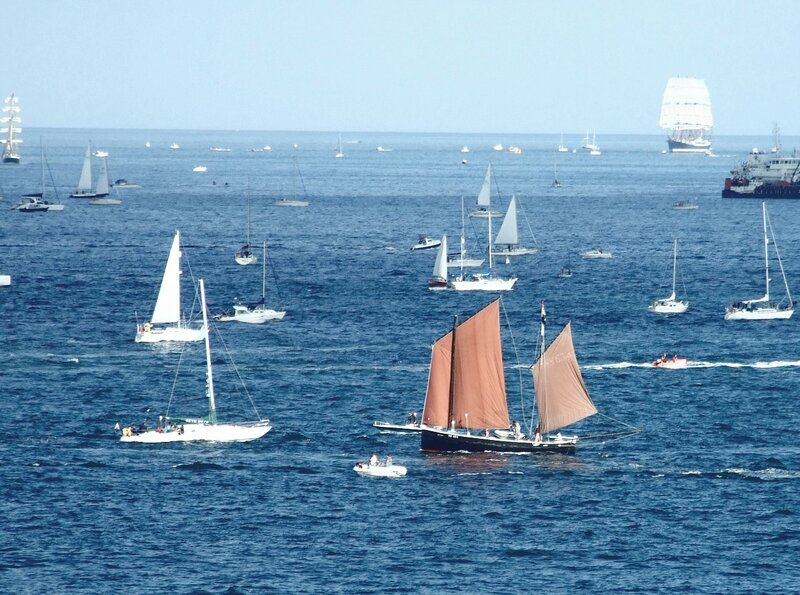 The lugger in the last picture (tan bark sails) isn't a Beer Lugger racer is it? There's just not quite enough resolution in the photo for me to make out the sheeting and tack arrangements. In any event, Gavin is there any chance you may be able to cover those amazing Beer luggers here? They hail from the town of Beer, a fishing village on the Channel coast. They have a most intriguing easily tacked rig of ancient origin that may have once been widespread, but now it seems is only preserved over there by the Beer Sailing Club. There is much mystery about it, and any info would be a great service to sailors everywhere. 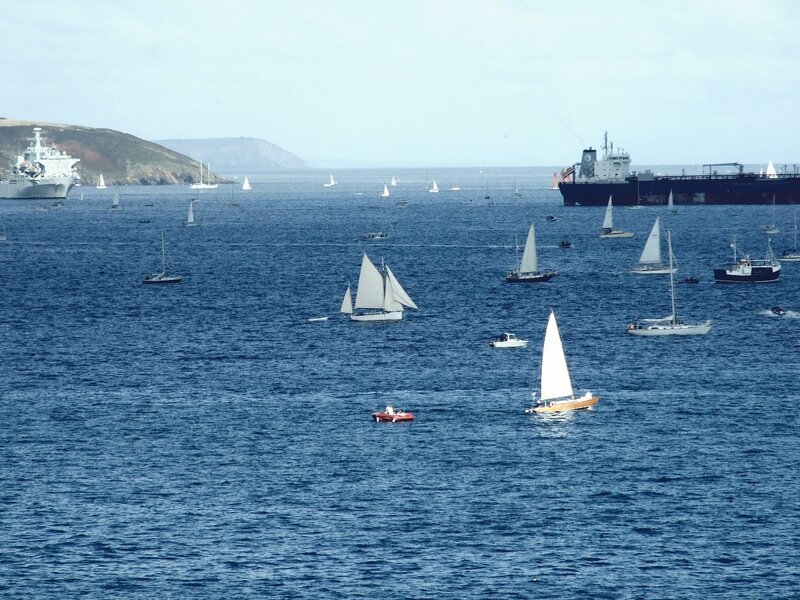 I think the boat with red sails is probably the pilchard driver Barnabas, one of the local boat types. Some years ago I dropped into Beer to take photos, but unfortunately nobody was sailing. I came home with a collection of photos of a shingle beach with a row of two-masted clinker-built boats. Sadly, I'm not sure I could find them now. However, the web has this link, complete with an bewitching photograph, and also the website of the Beer Sailing Club has some more to add. I don't know if the evolutionaty process was – working punt – red boat in photo -flashboat – but they certainly look that way. Note that the flashboat has four oarspeople whereas the red boat has three. I think the red boat is a type known as a ran-dan, which phrase is also used on the thames for the same rowing configuration (middle person has two oars). 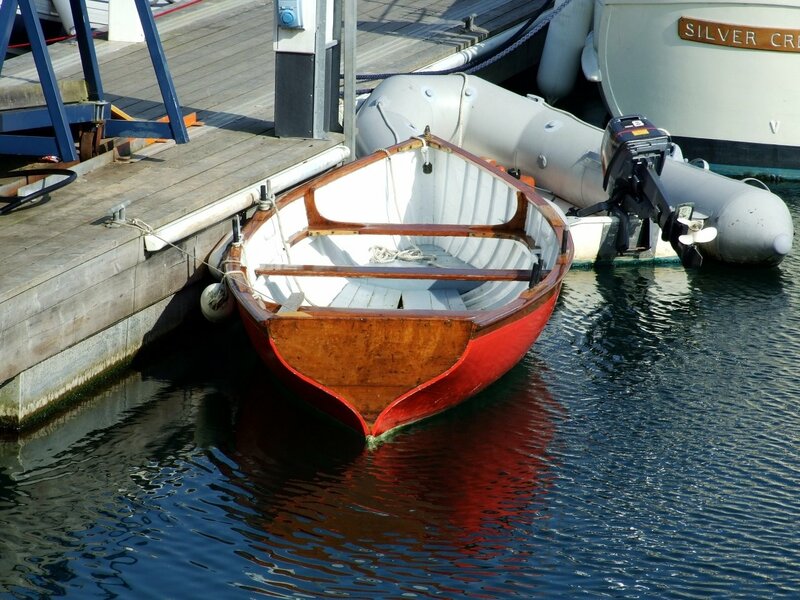 When I worked in a boatyard in Penryn in the early eighties a fellow boatbuilder built one (cold moulded) and I often used to see him and his mated charging up and down the river. It was interesting to watch the motion of the boat – as the three of them pulled their weight moved forward causing the boat to have a curious pitching movement. As for the ancestry, he plumb stem, wineglass transom was ubiquitous throughout the southwest, and I've no idea about the family tree, although I'm sure it's well known. 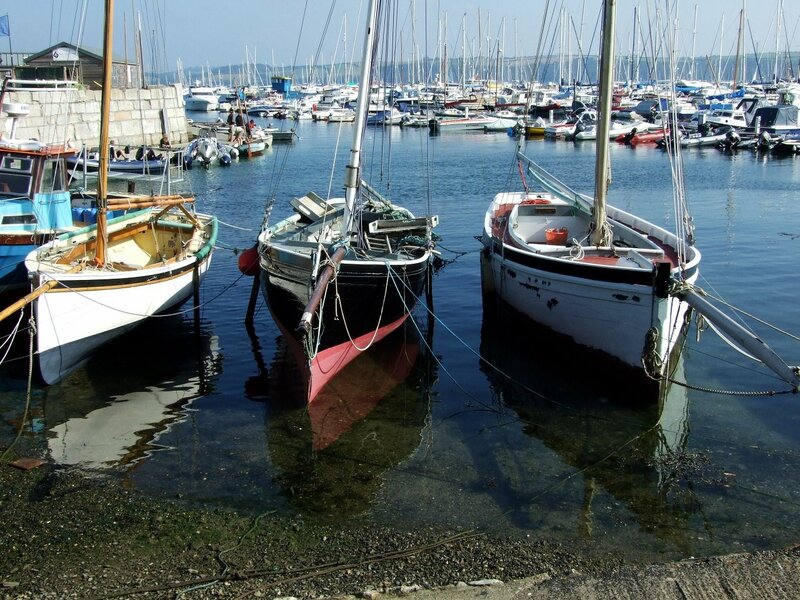 I grew up looking into harbours packed full of boats such as these and larger. I love them. 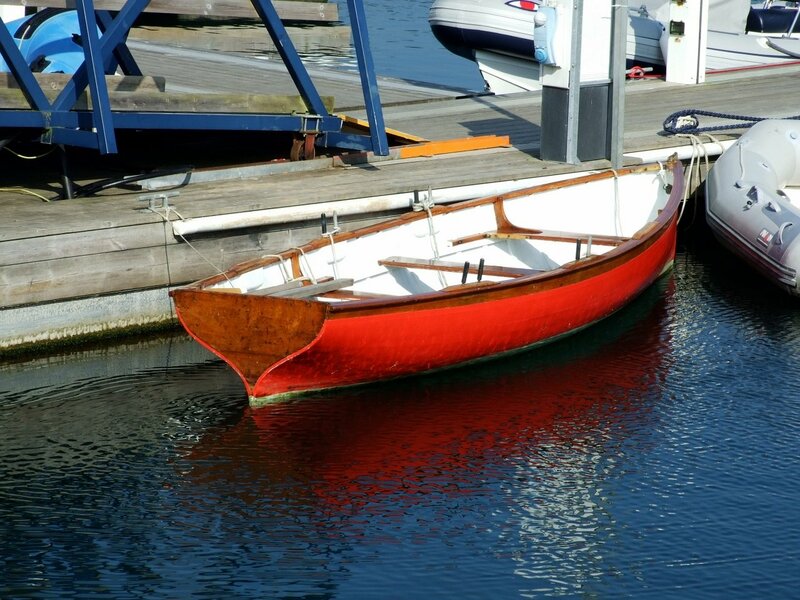 If you asked me what a boat should look like (in all it's glorious simplicity) I would say that red boat. I was offered one for £200 in 1980, and to my lasting regret turned it down (nowhere to keep it at that time). It had 3/8" carvel planking! It could be the same boat as in the pic, there can't be many of them, although I would say the one I was offered was narrower. Notice that although the boat is obvioulsy lightly built it has quite a hefty look to it – quite a flat sheer so that all thole pins are the right distance above water, and also quite full ends – a high prismatic coefficient allows a higher speed if the power is available, which it is with three oarspeople.